How can something be free and great? Perhaps 20 years ago you would not think that way. In today's online world. Free is almost synonymous with great/incredible/super/excellent/first class. These are extremely successful products that are created by very talented individuals. Many of them are billionaires. So today in the online world, FREE = SUPERB. If you are into trading, you would probably have come across this charting software called Freestockcharts. I have been using freestockcharts for years now. Here is what I found to be great and incredible about this charting software. The first thing that is great about Freestockcharts is that it is free! The basic version is free to use. As it is advertisement supported, you still get to use a wide array of stuff. If you are a swing trader or position trader, the free version is actually more than enough for you to get started. The premium version is not that expensive. You can get started with $19.99. That is the one I'm using. Mainly to use their Easy Scans and also to get more screen real estate by getting rid of the ads. 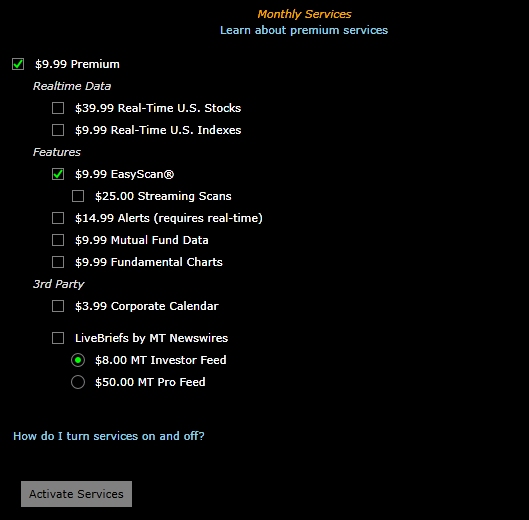 As you can see above, the real time data for US stocks costs $39.99 per month. You do not need to subscribe to the real time data if your broker provides you with it. That way, you can save up on quite a lot. One of the great things I like about Freestockcharts is the ability to do multiple time frame analysis quickly. 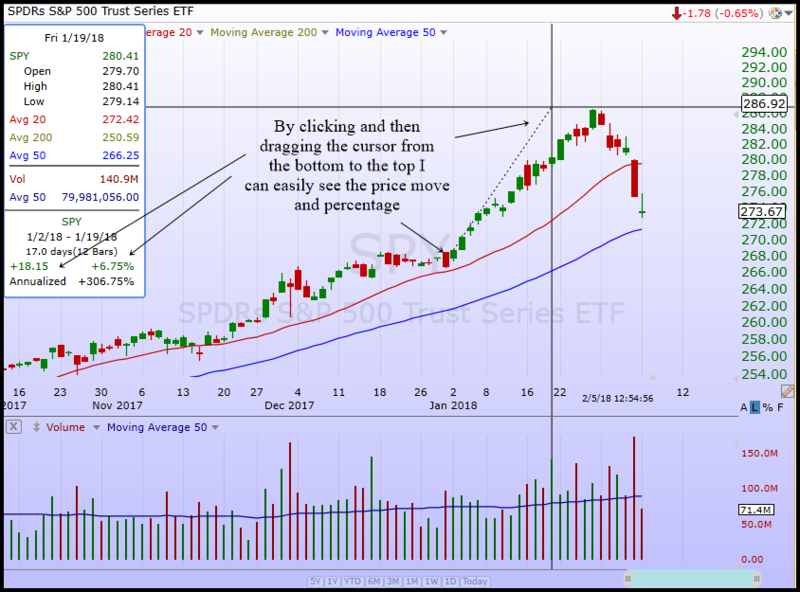 The above shows how I setup my charts. Different traders will have different type of setups. Some will even have multiple screen to see a ton of data. For me, I like to keep things simple. On the top left, I have the list of stocks. On the bottom left, I put the daily charts with some indicators. The main chart on the right is usually the 60 min chart, 15 min chart or 5 min chart. I position it that way so that I am aware of the bigger picture as well as the smaller picture. Usually the bigger time frame is to find setups and the smaller time frame for entry. I always do multiple time frame analysis because I want the bigger time frame to provide me with a catalyst that will move the stock in the smaller time frame. Freestockcharts enables me to switch between time frames quite easily. If you use other stock chart providers especially web based ones, you need to manually click on the buttons to get the time frame. It can be quite slow and cumbersome. Using Freestockcharts, I can switch between time frames by pressing the hot keys on my keyboard. All these shortcut keys allow me to view the different time frames of a stock extremely fast. A good charting software will allow you to customize the look and feel of your trading control center. Some people like to have a white color background. Some will like to have a black color background. Others like me like to have a blue background and a white background. Blue is my favorite color. If your favorite color is pink, you can easily customize it to pink! Some prefer their candlesticks to be set differently from the default settings. 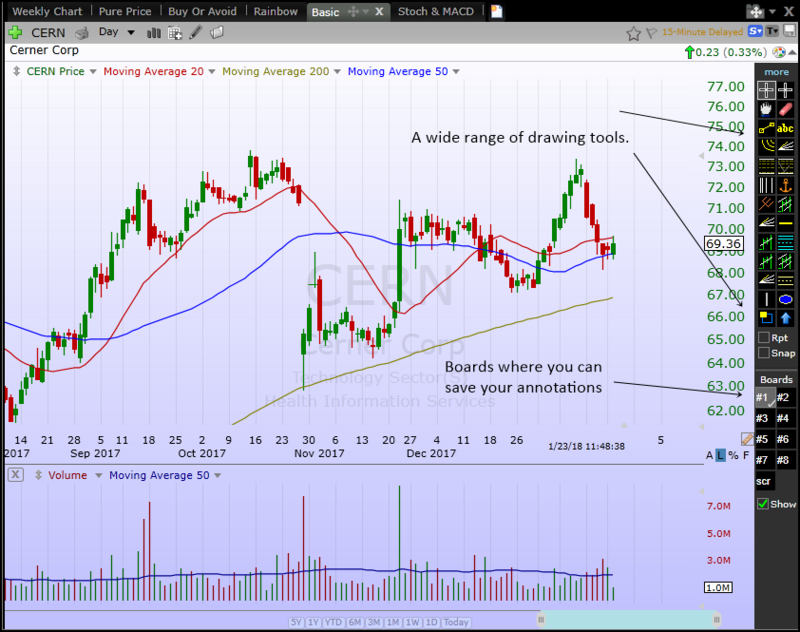 Just to summarize, you can easily customize the look and feel of the entire charting software to your liking. What if you want to have different set of tools to analyze different types of trading environments? A good trader will know what tools to use in different situations. Just like a cook in the kitchen will use different knives to cut different meats, the trader should employ different tools to analyze different environments. To be honest, it is very difficult to put every indicator into a single chart. If you do that, you will cloud the price. The indicators will take up 70% of the chart and you are left with a very small price area to analyze. Freestockcharts allows you to setup different chart setups. 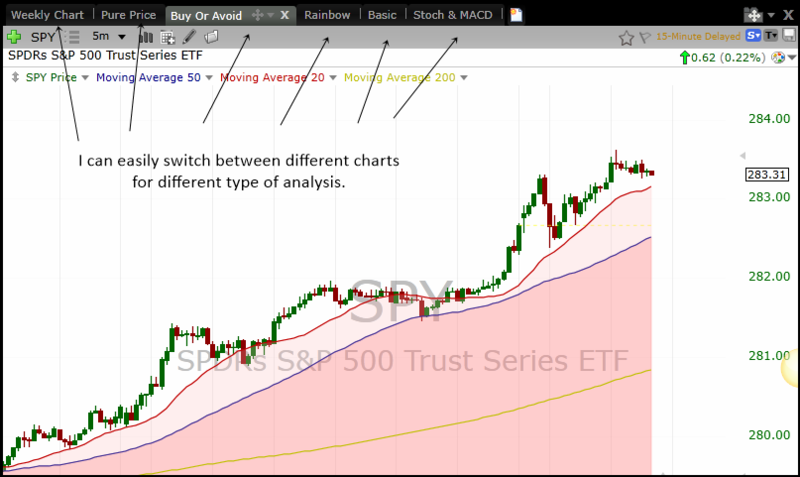 The above image shows what I do with my own charting setups. I have 6 types of charts in my charting software at the moment. If I were to set up the chart again and again it will take a lot of time. What I do is I setup the chart the way I want and then save it. Then I just click the tabs on top of my chart to call out the chart style. Have you ever looked at a stock chart and then suddenly wanted to write down your observations? With Freestockcharts, you can easily do that. The good thing is once you have annotated and drawn trendlines, fibonacci etc on your chart, it will be there always until you delete it. You can see above the wide range of drawing tools available. You can draw trendlines, Fibonnaci retracements, pitchfork and a host of other instruments. Once you have annotated your charts, the software automatically saves all your drawings. So, one month later when you go back to the same stock symbol, you will still see your annotated drawings. 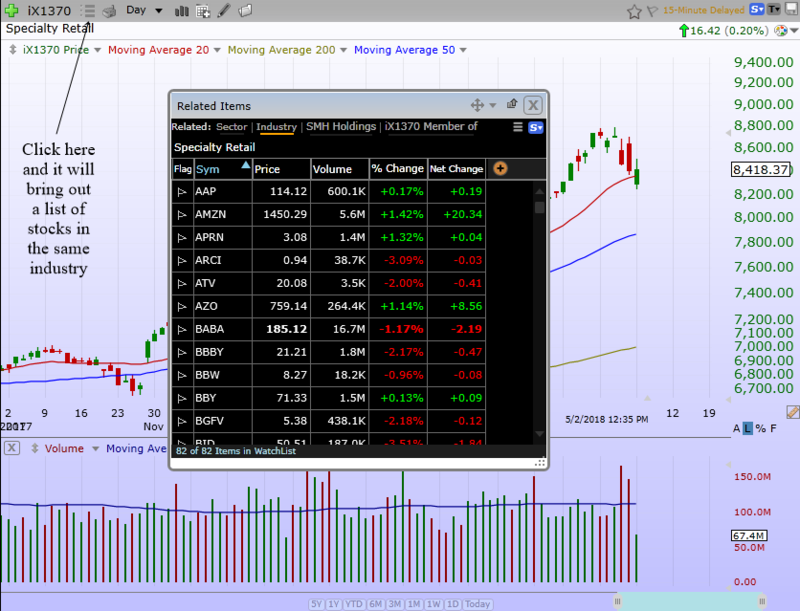 If you like to keep your annotations separate from the normal scrolling of stocks, you can save them in boards. Let's say Board #1 is made up of trendlines and Board #2 is made up of Fibonacci retracements. When you click on Board #1 you will only see trendlines that you have drawn and no Fibonacci retracements. Freestockcharts is the best charting software that I have come across that enables me to scroll through 100 stocks in less than 5 minutes. I like to trade the Nasdaq 100 stocks. Every day I would scroll through the list of stocks in the Nasdaq 100 looking for certain setups. I will look at the daily chart once. Then I might look at the 15 min charts of Nasdaq 100 one by one. Sometimes I will look at the 60 min charts of all 100 stocks one by one. I scroll through the daily charts of S&P 500 stocks sometimes. Yes all 500 of them one by one. I start with the "A" and work my way through to "Z" looking for certain patterns. So in a way I do not even need a scanner. My eyes are the scanner. How can I accomplish this so fast? I just press the "down" button on the keyboard and the charting software will load the chart in less than 1 second if the internet speed is fast. The above screenshot captures how I scroll through the Nasdaq 100 stocks easily. Especially during trading hours, I can quickly scroll through them. I usually use 2 time frames. The main chart will be the timeframe that I will look for setups and the left one will be a chart in another timeframe so that I can seek confirmation on whether I can enter the stock with the best timing. 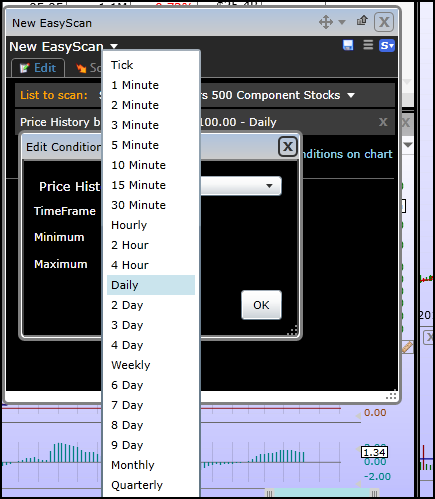 Freestockcharts have a stock scanner which they call "EasyScans". They offer quite a lot of technical scans as well as fundamental scans which you can input into the criteria. The range of conditions and criterias available are enough for a trader. Perhaps there may be some better scanner out there but the available conditions are enough to make a good combination to find your next trade. One of the amazing things I notice about their scanner is you can scan by time frames. For example, suppose you want to scan for a stochastics buy signal. You can scan for buy signals in the 5 min, 15 min, 60 min, daily, weekly, monthly and even yearly! The range of possibilities are endless and they are actually quite easy to use. You just need to play around with it and with experience, you will be able to create your own set of scanning criterias. 9. Want To Know Which Are The Top Gainers And Losers In The S&P 500? Do you want to know which are the top gainers or losers in a list? And can quickly scroll through them to see the charts? Well, you can do so using Freestockcharts. 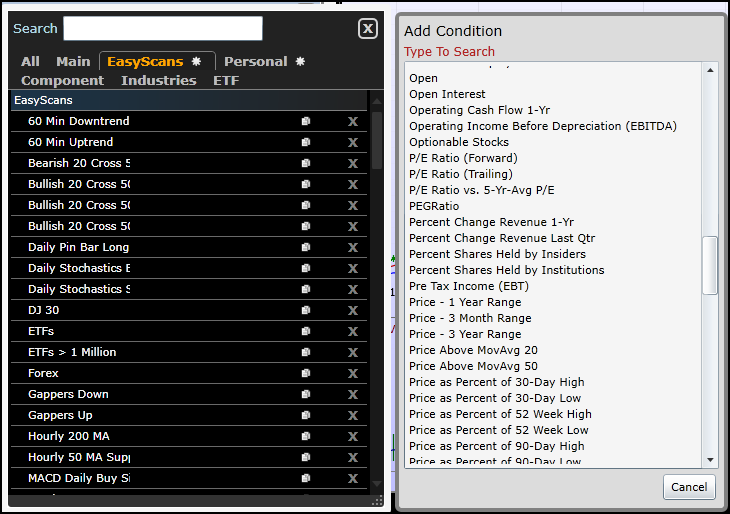 Just bring up whatever list (ex...S&P 500 stocks) and click on the % change and the software will quickly sort the top gainers from top to bottom. You can scroll through them quickly to see how the charts are setting up. This is very useful for momentum traders who like to day trade hot stocks. You can see the daily chart on the bottom left and use the 5 min chart to finds setups. Of course, a Real Time Data subscription will be needed to fully benefit from this. I am a trader who loves to share my thoughts and analysis with others. In the world of social media today, there are so many websites that you can share your analysis. Will you lose if you share with others? Well, if you are not holding a billion dollar position then it really does not matter. Your opinion does not matter in shaping the outcome of the stock. But it might matter to your friends and circle of fellow traders. I have been sharing so many stock charts that I have annotated in my Telegram group and also on this website. Most of the stock charts come from Freestockcharts. The other I use a lot is from investing.com. I just right click on the chart in Freestockcharts and save the image of the chart. Then I use photoscape to annotate them for the benefit of my readers and friends. I'm not sure whether Freestockcharts have all the stocks in the entire US market in its database. I know that they have Canadian stocks to look at. They do not offer you a comprehensive list of stocks all over the world like what investing.com does. 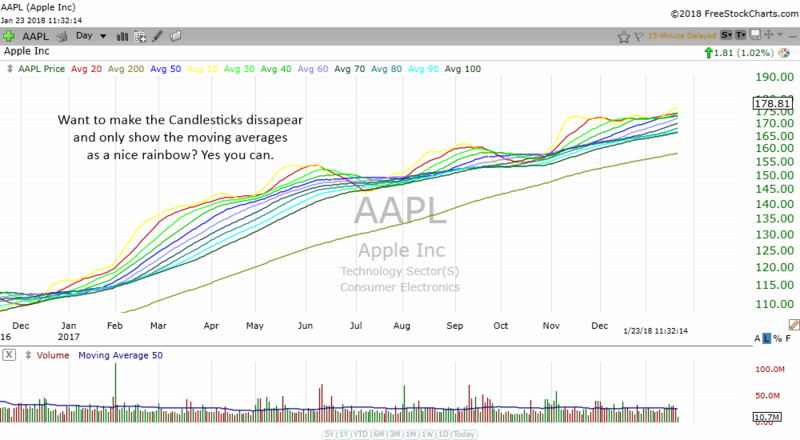 I only use Freestockcharts to look at the charts of stocks that are listed in the US market. Be it the NYSE or Nasdaq. 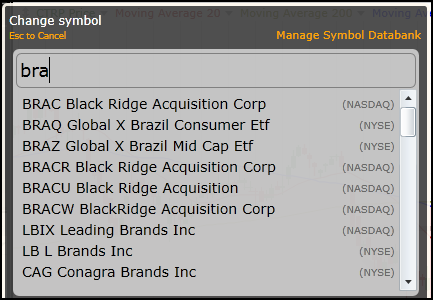 In my opinion the list of stocks that are available in Freestockcharts is enough for a trader or investor to make money from. You will find almost all the stocks that you need or want in this charting software. One of the amazing things about Freestockcharts is the speed at which you can search for a stock. You don't even need to know the ticker symbol. All you need to do is type in the name of the company and a list of stocks that have that name will appear. Then you just click on the relevant one to bring in the stock chart. All these takes place in less than 1 second. Some websites take quite some time to bring out the list. Which is frustrating if you need speed. Searching for a stock? Just type the name and a list will appear quickly. For those of us who have been trading for awhile, we will recognize the importance of studying a stock's sector and industry. Normally, if the sector is doing well, the stocks within that sector will do well. Which is why you need to study the sector and industry chart and look for utprends and support areas. Sometimes you can even spot chart patterns in the sector and industry chart. When I use Freestockcharts, I do not need to memorize or even know a stock's sector or industry. All I need to do is to look at the chart itself. 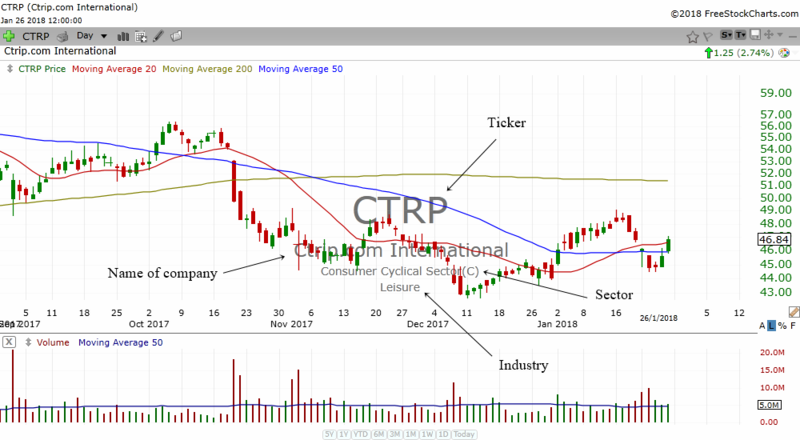 The chart above is the chart of CTRP. The amount of information in this chart is staggering if you know what to look for. The letters in caps at the middle of the chart is the ticker symbol of the chart. In our case, it is CTRP. This stock is listed in Nasdaq as most Nasdaq stocks consists of four letters. Below the ticker symbol is the complete name of the company. Then below it is which sector the stock is in. CTRP belongs to the Consumer Cyclical Sector. Lastly, we know that CTRP is in the Leisure Industry. All these are very important if you want to do some sector/industry and intermarket analysis. 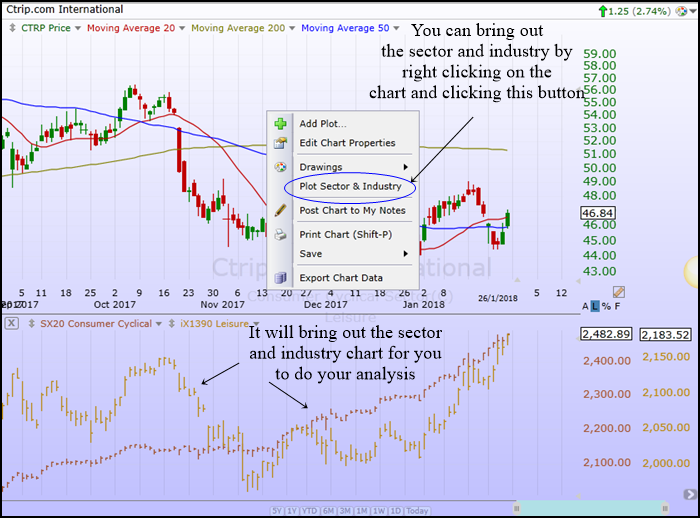 With Freestockcharts you can easily bring out a stock's sector and industry charts. Just right click anywhere on the chart and click on Plot Sector & Industry. You will then be able to see the sector and industry chart for you to do your analysis. Let's say you wanted to look at the stocks in the same sector or industry of your stock. You can do it easily using Freestockcharts. Let's take AMZN for example. 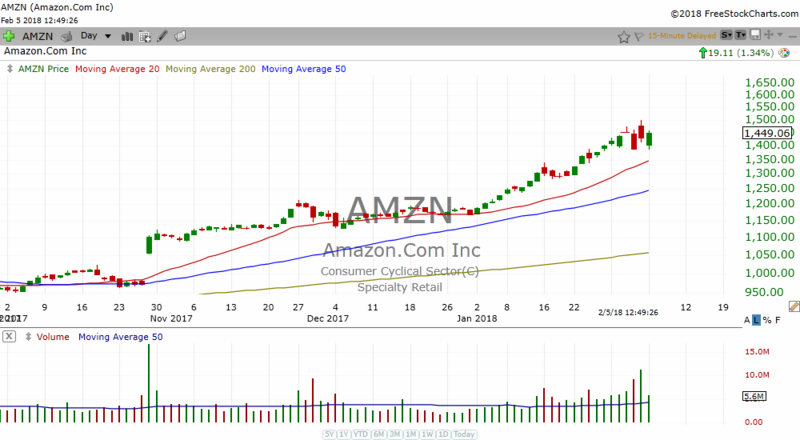 By looking at the chart above, you know that AMZN is in the specialty retail industry. The information can be found in the middle of the chart. You then search for Specialty Retail and out comes the chart. The you click on the tab I show you above at the upper left. Out comes the whole list of stocks that are in the specialty retail industry. You can easily scroll through the charts one by one. You can do the same with stocks in the same sectors. You can also bring out the components of an ETF easily through this way. Do you ever wish to know how much the price has moved from one point to another point? You might even want to know how many percentage points the stock has moved. Thankfully Freestockcharts allow you to do this easily. All you need to do is to move your cursor over a price area and left click and hold the mouse and drag the cursor to a price point you want. For example, in the screenshot above, I drag the cursor from the lower left to the high of the move in SPY. Out comes a little box that shows me that SPY has moved 18.15 during that period and has gone up by 6.75%. It also tells me how long the run up took. In this case it took 17 days. The information at the top of the box is the info for the day that the cross hair is at. In this case it is Friday, Jan 19 2018. You are given the open, high and low of the day. Then they also give you the values for your indicators. Volume on that day was 140.9 million with the 50 day average volume of about 80 million. I'm showing you the benefits of Freestockcharts because I use it every single day. When you find something useful, it is always good to share it with others. This charting software may not be for everyone. You might even prefer their more premium product TC 2000. Perhaps you prefer other charting softwares. That's ok.
At the end of the day it really depends on what you are using the charting software to accomplish. If you are into day trading, then you might need more sophisticated software. On the other hand, if you like the format of stockcharts.com you can still continue to use that website. I just happen to like Freestockcharts and I hope that you may find it useful too.